Tasty sandwich recipes are one of my favorite types of portable foods and easy-to-make lunches. If all that comes to mind when you think of making a sandwich is getting out the PB & J or turkey and Swiss, or maybe some bacon, lettuce, and tomato if you’re feeling adventurous, then you’re missing out on some seriously delicious–and portable–eats. Shake up your salad game with these seven sandwich recipes, which range from restaurant staples and spins on all-American faves to vegetarian meals like North African-style poached eggs in a pita. Oh and if you want to take a sandwich–and other food, for that matter–with you as you go about your day and keep it fresh, I highly recommend this meal bag from 6 Pack Fitness. Whether you’re looking for a unique combo of bread, meat, cheese, and condiments – or a classic pairing you could never figure out how to perfectly construct at home – The Encyclopedia of Sandwiches has something delicious for your lunch bag. 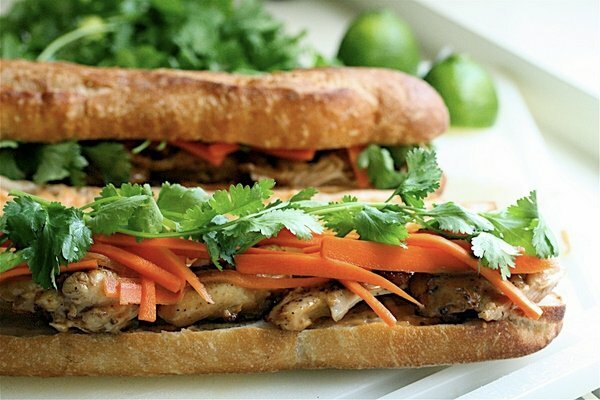 Take this sandwich for example, which is both a Vietnamese classic and a new favorite for American palates. 1. Preheat the oven to 400°F, and then toast the baguette on the center rack for about 10 minutes. Meanwhile, mix the shredded carrots and daikon, sugar, and rice vinegar in a small bowl. Toss to coat, and set aside. 2. In a separate bowl, mix the fish sauce and soy sauce. Slice the toasted baguette, and brush with the combined sauces. Spread the mayo and pate on the top half, and place cucumber, onion, jalapeno, and the marinated carrot-daikon mix. 3. Lay the cooked chicken on the bottom half of the bread, and garnish with fresh cilantro. Carefully flip the sandwich halves to stack them, slice them, and wolf them down immediately. This is a classic for eating out, especially for those who live in Miami and my neck of the woods, Tampa. But despite the universal appeal of this meaty sandwich, most wouldn’t know where to get started with making one at home. Having a Panini press certainly helps, but you can also use a simple pan on the stove with something substantial on top for the pressing, like a foil-wrapped brick, sheet pan plus a heavy saucepan, or a cast iron skillet. 1. The day before, marinate the pork. In a bowl or plastic freezer bag, mix together the citrus juices, garlic powder, and mustard. Trim the silver skin from the tenderloin, and add to the bag. Coat well with the marinade, and place in the fridge overnight, five hours minimum. Flip the bag one or more times as it sits. 2. When ready to prepare the sandwiches, preheat the oven to 375°F. Take the pork out of the bag, and season to taste with salt and pepper. Over high heat, add 1 Tbsp. olive oil to a large oven-safe skillet. Add the tenderloin to the pan, and brown for a couple minutes per side. Once there’s a good sear, place it in the oven for about 20 minutes. 3. After the pork has been removed, let it rest for 10 minutes. Spread half the mustard on each roll, and when cool, slice the meat thin to layer it on the sandwich. Add the ham, pickles, and cheese on top, and then finish with the other half of the roll. 4. Cook the sandwiches with a Panini press, or press them in the skillet with a heavy lid, pan, skillet, etc. 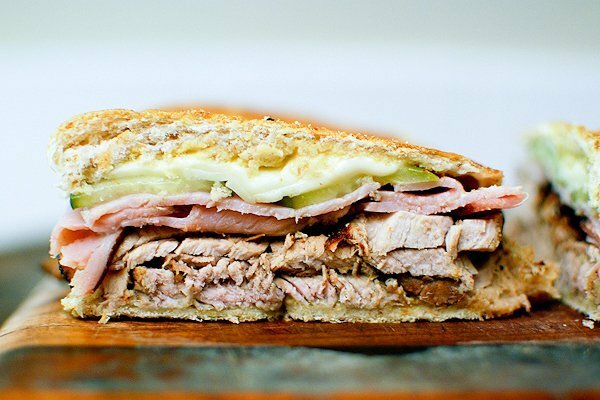 The Cuban sandwiches are ready to eat 5–10 minutes when the cheese is melted and bread is toasted. Since this vegetarian meal gets plenty of protein from eggs, you may not even notice there’s no meat in the hearty and healthy pita filling. There’s plenty of other delicious ingredients to distract your taste buds too, including fresh peppers, creamy feta, and za’atar – a mix of citrusy sumac, sesame seed, and herbs. 1. In a large skillet over medium-high, heat the oil to cook the onion. Before the onion is fully translucent, add the garlic. Cook for another minute. Once the garlic becomes fragrant, add all the peppers, and sauté until tender. 2. Season everything in the pan with salt, cumin, and paprika. Cook for another minute, and add the crushed tomatoes. Fill the can halfway with water, and pour in. Bring to a simmer. Reduce heat to medium-low, and stir occasionally as the sauce simmers for 15 minutes. 3. Use a large spoon to make six wells in the sauce, evenly spaced apart. Cover, and cook for 3–6 minutes, depending on desired doneness. 4. While the eggs cook, warm the pita. Slice open, and scoop one or two eggs inside with sauce. Then, garnish with feta, fresh chopped parsley, and za’atar, and enjoy. 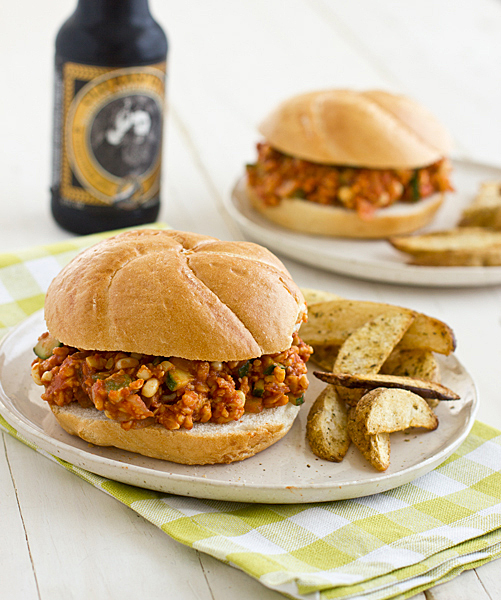 While it’s generally a good idea to limit soy intake, tempeh can make a nutritious, high-protein meal like this vegetarian take on the traditional Sloppy Joe’s sandwich. 1. In a large skillet over medium-high, heat oil to cook the onion. About 3 minutes later, crumble in the tempeh, and cook for a couple more minutes. Add the brown sugar, garlic powder, and cayenne, and stir until tempeh is evenly coated. 2. Reduce heat to medium before adding the green pepper, zucchini, corn, red wine vinegar, and soy sauce. Cook for 3 minutes, stirring constantly. Pour in the tomato sauce and tomato paste, and season with salt and pepper. 3. Stir until all vegetables are softened, and the sauce thickens. 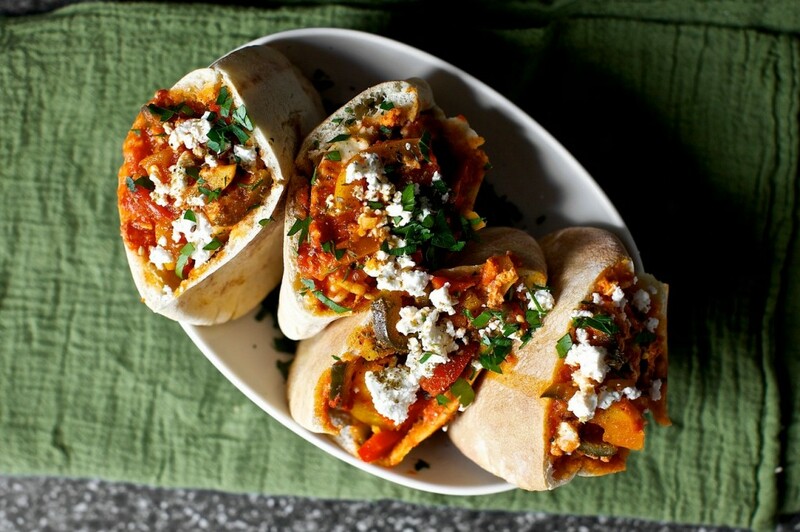 Spoon the sloppy tempeh mixture onto the sandwich rolls, and serve. I know, the macros are a bit indulgent, but this sandwich is so good I just had to include it. It’s from the creative cookbook Panini Express, and it combines classic sandwich elements in a brand new way. This panini–and the rest found in the book–can be quickly prepared using a good sandwich press or “griddler“, or even can be grilled, making for a unique summer treat. 1. While you heat the Panini press, drizzle olive oil over the shrimp, and season with salt and pepper. Place them on the press to grill, and close the top to cook for 2–3 minutes. Move to a small bowl to cool. 2. In a separate bowl, make the dressing by mixing lemon juice, garlic, anchovies, mustard, and remaining 1/4 cup olive oil. Pour over the shrimp, and gently toss. 3. 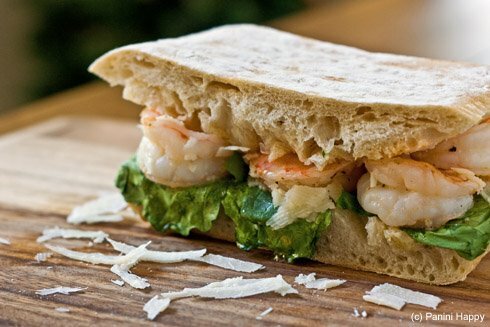 Slice the ciabatta rolls in half, and cut out some of the middle to make room for the shrimp. On the bottom half, layer arugula, shrimp, and cheese. Close the sandwiches with the top half of the bread. 4. Cook sandwiches in the Panini press until the edges are crisp and brown, about 3–6 minutes. Serve warm. This is a delicious lunch for anyone with a sweet tooth. It’s also an economical yet creative way to use your farmers’ market finds. Beets are available year-round and are a nutritional powerhouse due to carotenoids, folate, and betalains, which not only give this root veggie their color but also act as antioxidants and anti-inflammatories. 2. When ready to build the sandwich, mix the goat cheese and honey together, and in a separate bowl, coat the fresh greens with balsamic vinegar and remaining 1/2 tsp. olive oil. Season salad with salt and pepper to taste. 3. 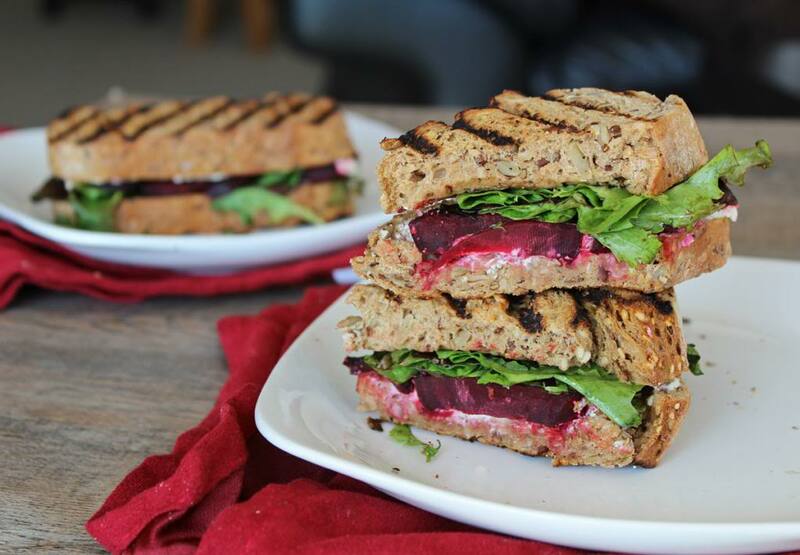 Spread the sweetened chevre on a slice of bread, stack beet slices on top, and finish with dressed greens. Top with a second slice of bread. Repeat to make the second sandwich. 4. Use a Panini press to finish the sandwiches, if you have one available. If not, toast and press them in a skillet or on the grill using something heavy on top, and flip after cooking for a minute or two on the first side. 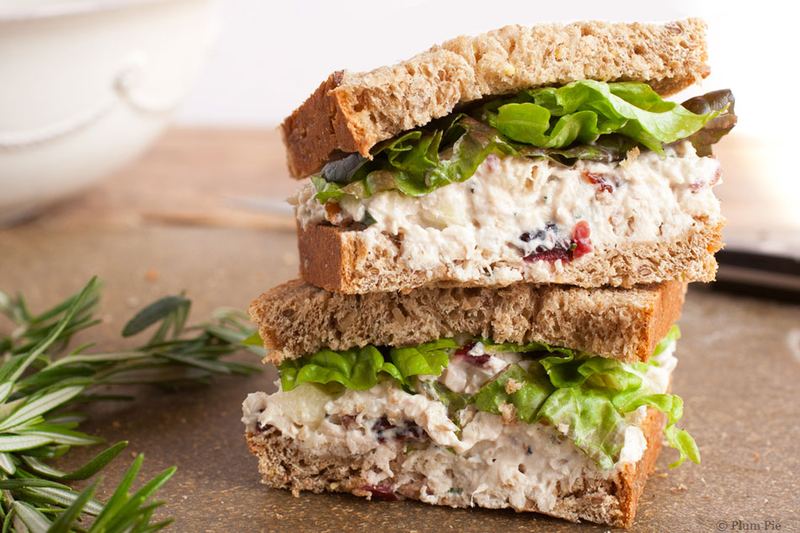 If you can’t go all summer without enjoying chicken salad, be sure to look for a recipe that’s updated to be more nutritionally balanced. Or, alter your family’s favorite by swapping some of the mayo for something equally creamy but with more health benefits, like low-fat Greek yogurt or a homemade veganaise that uses wholesome fats. This grown-up chicken salad has more blue cheese than mayo. It won’t cut down the fat, but it adds six grams of protein per serving. 1. In a large bowl, mix together blue cheese, chopped chicken, celery, mayo, green onion, lemon juice, salt, and pepper. 2. Spoon an equal amount of chicken salad onto the bottom halves of the buns. Place the top half of the bun over the sandwich filling, and enjoy. What did you think of these sandwich recipes? Have anything else to share? Let me know in the comments below! Muscle for Life Success: Sam R.